memetics simulation no. 1 is the first in a series. The piece uses interactive 3D graphics for an ALife simulation, running as a layer on top of a recombinant narrative system. The piece was first shown during the 2005 Boston Cyberarts festival, and then later installed in the RISD museum. 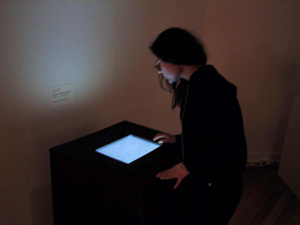 Participants encounter a touchscreen embedded in a pedestal. 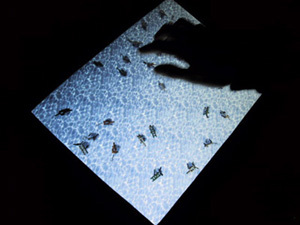 Displayed on the screen is a community of imaginary creatures, viewed from above. The creatures are formed according to stored information packets, or memes, that recombine when the creatures mate. Participants tap on the screen to mate or kill creatures, and to view the stored memes. In this way the piece represents the ideas of memetics, in which information moves through a community in a manner similar to genetics. The memes used to seed the simulation were all collected manually from the Internet, and fall into several categories, such as 'urban legends' and 'medical news.' The shapes and colors that comprise the creatures are symbolically related to these categories. Furthermore, the placement of shapes (ie. the creatures' various body parts) correspond to various grammatical elements (subject, action, etc.) within the memes. Thus, a creature whose stored meme includes the acted-on object from some passage of religious mythology would have a cross-shaped right-front leg. The interactive simulation was programmed in Blitz3D and uses graphics created in Maya. A 15" Planar touchscreen is used for both the primary display and input device. 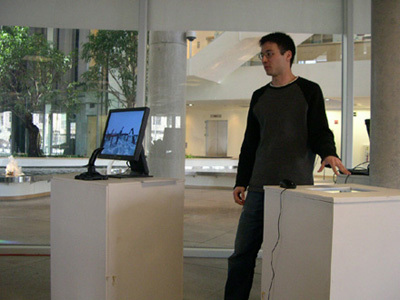 The version of the piece shown in the Boston Cyberarts festival also had periphery stations where participants could navigate through the community in first-person, while the version installed in RISD's museum abandoned the periphery monitors to focus on the central touchscreen. With this piece I started to realize the role of epistemology in my work. I became aware of meta-knowledge questions in my creations. The work is an illustration of an attempt to answer such questions as how knowledge is learned, how new knowledge is created, and how a society is shaped by the ideas passed around within it. There are two primary avenues apparent for future exploration. One is about adding complexity to the software, while the other avenue directs attention to the real-world presence of the piece. These directions will lead to memetics simulation no. 2.